Taking Holiday Parties to New Heights! WOW Your Guests this Holiday Season! Holiday party season is fast approaching and every year party planners try to come up with ideas of how to make this season’s social gathering more intriguing and special than the last. Leaving your guests with a ‘WOW’ factor following any event means the event was a success whether it be the food, entertainment or great feelings people experience during the party. If an event planner can stimulate the senses of the guests and evoke excitement then the guests are sure to leave on a positive note. As an event planner you want the guests talking about your event long after the party has occurred. Impressing your guests through visual, sound and taste methods will always bring positive results. Eye candy, amazing entertainment and fabulous food is always a winning combination.What better way to excite guests than through an experience they may not have considered trying on their own and draw guests closer through this shared experience. Venues chosen for events take many forms and shapes depending on how much pizzazz the planner is trying to accomplish for the guest. I have always been intrigued with the creativity taken by event planners to come up with new options that will excite those in attendance and leave them talking well after. Events can now be taken to new heights! It is no surprise that elevation can thrill a person. It not only ignites their sense of sight in being faced with views beyond the norm but it can also safely challenge those typically not drawn to experience higher elevations and stir feelings they’ve never had before. “Dinner in the Sky” is an experience to remember where up to 22 guests dine and float 50 metres in the air. The Toronto CN Tower ‘360 Restaurant’ offers an amazing dining experience for guests with its 360 degree rotating view every 72 minutes more than 351 metres in the air. The ‘Burj Khalifa’ in Dubai is a restaurant venue with a breath-taking view from the 122nd floor, 422 metres from the ground. Others with spectacular views would include the ‘Metropolitan Club’ in Chicago, ‘Sky Restaurant’ in Tianjin, China and the ‘Palace Club’ in Taiwan just to name a few. Las Vegas is well prepared for parties reaching new heights at the ‘High Roller’ located on the Las Vegas Strip, across from Caesars Palace! 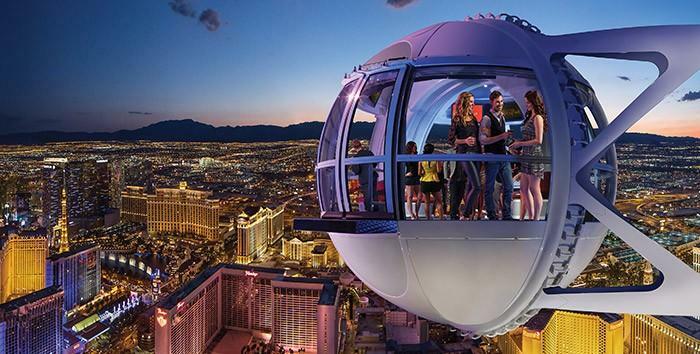 You can rent an entire pod with bartender and have up to 40 guests mingling 550ft in the air! Can you imagine how jaws will drop when you invite guests to the tallest observation wheel with 28 pods designed for private events and equipped with seating, multiple monitor screens and floor to ceiling glass windows to take in the 360 degree view of one of the most fabulous cities in the world. When planning your holiday party this year consider appealing to your guests’ senses by using multiple cover photos and video technology on your Eventastic invite to reflect various aspects guests will be experiencing. You’ll be able to showcase aspects of your event like venue, delectable food, planned entertainment and even add one or multiple video’s to entice and excite your guests even further prior to your event. Happy Holiday Party Planning from Eventastic! This sort of clever work and exposure! Keep up the wonderful work guyss I’ve added you guys to blogroll.